“Germany indeed," I thought to myself as I stepped on the wharf at Tsingtau, and found a sign con­fronting me which warned the public that certain things were streng verboten. 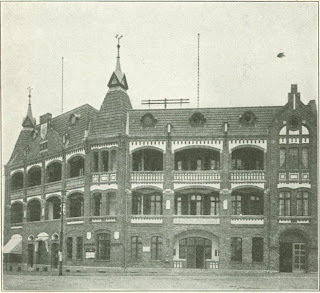 The two days' trip from Shanghai on the little Hamburg-American coasting steamer, the social chats with her genial captain, and the polished conversation of the "Herr Major," the only other passenger, had caused me to forget the curious hybrid of East and West which one sees in all the ports of China. As we approached the rugged coast line, and white houses and red-tiled roofs came in view, I tried to recall where I had seen such houses before. As we rounded a point and dropped anchor in the harbor, blue-coated soldiers and precise, uni­formed officials came into view. But with these placards - the evidences of an omnipresent bureaucracy - my impressions were complete. 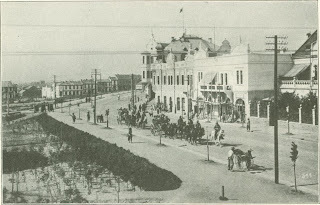 This was not Tsingtau, the capital of the Ger­man Kiao-chau protectorate - it was Germany itself, as much so as if a piece of Prussia had been picked up bodily and pieced into the Chinese coast line. Kiao-chau Bay is a broad expanse of water indenting the southern coast of Shantung province - that part of China which juts out boldly between the Gulf of Pechili on the north and the Yellow Sea on the south. The entrance to the Bay is narrow and easily defended. The bold, rocky coast line here throws out wedges of land on either side, which almost enclose the body of water within. The wedge of land to the east, though running down to a narrow point, widens out toward the mainland, the hills which form its backbone at the same time be­coming more rugged and prominent until, about thirty miles away to the northeast, they reach an elevation of 3,000 feet. Just inside the point of this wedge, protected from the typhoons which sweep up the China coast, lies a natural harbor which the Germans have improved by the construction of a breakwater. On the opposite side of this point, where the southern slope of the hills overlooks the sea, are the white walls and red roofs of the German town of Tsingtau. The Kiao-chau protectorate, or Shutzgebiet as the Germans call it, em­braces the entire area of the Bay, these two wedges of land at its entrance, and a, few small islands which command the approach - altogether an area of about five hundred square miles. Besides this, the German Government exercises a qualified sovereignty within a zone about thirty-one miles in width surrounding the Bay. Within this neutral zone, as it is designated, the Chinese authorities can take no action without the concurrence of the Ger­man Governor. The acquisition of Kiao-chau was accom­plished in the '90's - those sordid days when bullying aggression on the part of European Powers was pitted against the venality and duplicity of the old Chinese officialdom. Japan had just emerged victorious from her contest with China. England had acquired by lease the harbor of Wei-Hai-Wei; the Cassini Convention had given Russia important railroad advantages in Manchuria, and France was receiving railroad concessions in the south. Early in 1897, therefore, the German Govern­ment had decided to seize some port on the Chinese coast - the only question was what port would best suit her purposes? Which section of the Chinese coast line should she grab? With characteristic Teutonic thorough­ness a commission of experts was therefore sent to China to report upon the situation. After taking observations and canvassing the claims to seizure of most of the ports on the coast, the commission decided unanimously in favor of Kiao-chau Bay. Everything was ready for the final act of aggression when, by a special Providence, on November I, 1897, two German Catholic missionaries were murdered in the western part of Shantung province. These men hap­pened to belong to a religious order which the Kaiser had expelled from Germany but a few years before. This circumstance, however, was forgotten under the pressing necessity of obtaining immediate reparation for the outrage. 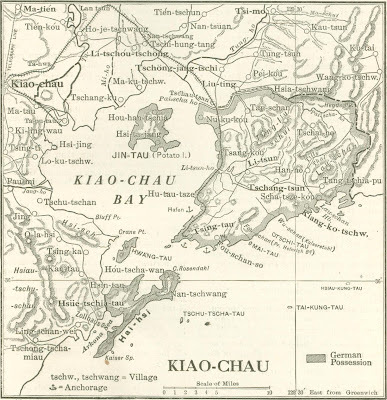 On November 10, 1897, the German Asiatic squadron dropped anchor in Kiao-chau Bay. On the 14th the town of Tsingtau was seized, and the German commander issued a proclama­tion in which he formally took possession of the territories that are now embraced within the protectorate. With the desired prize already in its grasp, the German Government entered upon negotia­tions with Pekin. By a convention signed on March 6, 1898, China was compelled to give her sanction to this seizure, and further, made the following concessions: (1) Permission to the German Government to build three lines of railroad in the province of Shantung con­necting the towns of Tsingtau, Chinanfu, the capital of the province, and Ichoufu, an im­portant city in the south; (2) the exclusive right to develop mines within a zone extending about ten miles on either side of the railroad lines; (3) preference to Germans in all enter-prizes undertaken for the development of the interior. Immediately after the seizure, and without awaiting the termination of the negotiations at Pekin, the German Government proceeded with the strategic and commercial development of the territory. 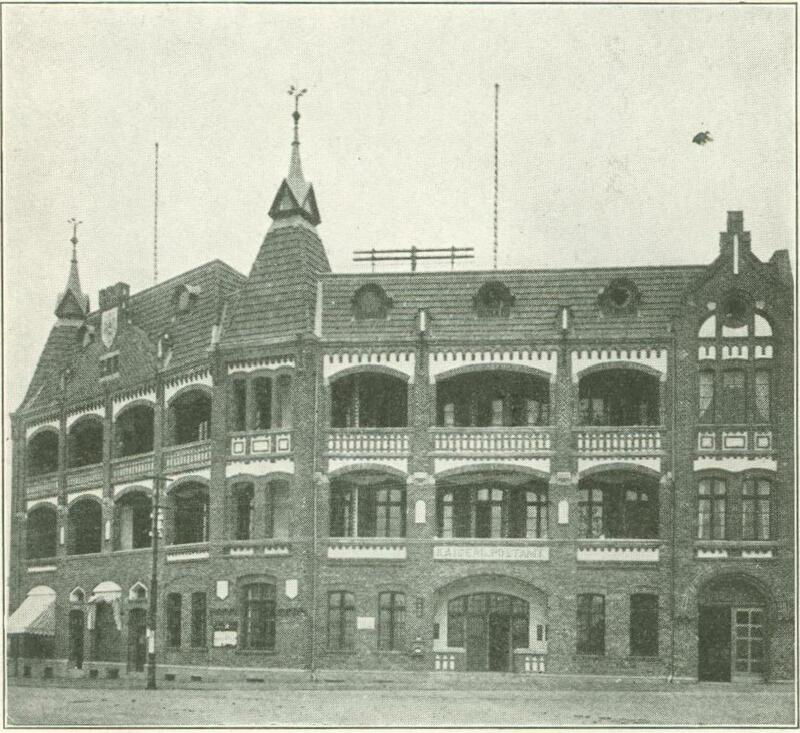 The old Chinese town of Tsingtau was razed, and on its site the German town was built. From the top of a command­ing eminence the administration building over­looks the sea, the city, and the expanse of Kiao-­chau Bay behind the city to the north. The Gouvernements Hugel, as it is called, forms the centre of a scheme of boulevards, chaussees, and well-ordered streets. 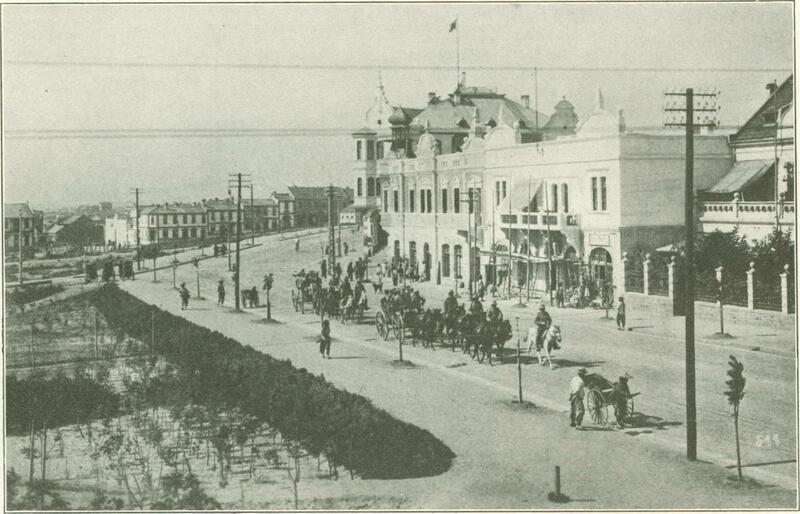 The seashore has been faced by a massive wall along the top of which extends the Kaiser Wilhelm lifer, a fine driveway, where of an evening may be seen driving or promenading the officialdom of Kiao­-chau, the uniformed officers of the army and navy, and the substantial business folk. On this chaussee stands the imposing Hotel Prince Heinrich, an important adjunct to the social life of the community. The private dwellings are models of German architecture. Each house has a big dooryard, with beds of tulips and rows of four-o'clocks. Should you chance along in the early morning you will see the stolid Hausherr leaning out of an upper story window, drawing comfortably on a long pipe, and chatting with his next door neighbor. Very few Chinese are about, al­though there are 80,000 of them in the protec­torate. 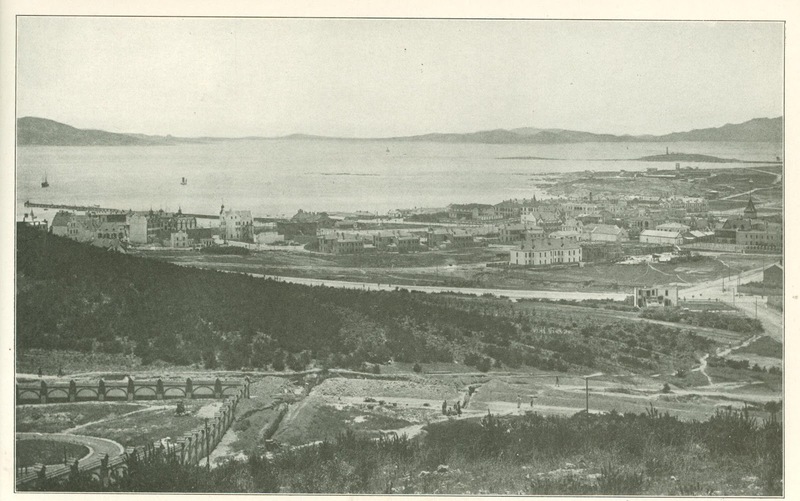 They are not allowed to live in Tsing­tau, but are confined to a separate quarter in order that they may not disturb the order and cleanliness of the German settlement. The wharves which line the harbor have been furnished with tracks, electric cranes, and all the facilities for handling a large traffic. The harbor also contains a floating drydock, which has a capacity of 6,000 tons and can accom­modate ships 135 feet long. The rocky heights to the east of the city have been reserved for fortifications. No one knows just what engines of destruction lurk here. Barbed wire fences, warning placards, and vigilant sentries intercept the curious sightseer, and the unbroken contour of the hills gives no indication of the galleries and passages with which they have been honeycombed. But the last official report shows that the Government has already spent more than $5,000,000 in fortifying these heights, so one may readily infer that they constitute a veritable Gibraltar, rendering the protectorate almost impregnable in attacks from the sea. The configuration of the country makes Kiao-chau Bay the natural outlet for the Prov­ince of Shantung. Extending about twenty miles inland, the Bay washes a low plain, which reaches out across the Shantung peninsula to the northeast and separates its two mountain regions. To the east rise the bold rocky ridges which make up the Shantung promontory; to the west lies another group of mountain ranges which crowd down to the southern border of the province, but on the north are separated from the coast by a wide plain, while on the west they fall away into the broad valley of the Yel­low River. It is therefore possible from Kiao-­chau Bay to reach the extreme north and west of the province over comparatively level country. These advantages of communication many centuries ago made Kiao-chau City, at the head of the Bay, the emporium of the whole province. Ships from Korea, Japan, India, and Arabia anchored close to the city walls. Since then, however, the head of the Bay has been gradually silted up, so that to-day the city stands six miles from high water, and with the ebb of the tide four or five miles more of mud flats are left baking in the sun. Trade has naturally vanished. 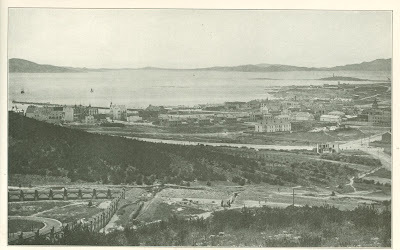 It is this pristine commercial im­portance which the Germans are seeking to establish by means of the harbor at the entrance of the Bay and the lines of railroad into the interior. The province of Shantung has an area of 55,000 square miles and a population of 25,500,000. It is rich in natural resources. Gold is being profitably worked in a number of places, especially in the neighborhood of Wei­-Hai-Wei. Coal and iron have been discovered in large measures, and are being worked by Ger­man interests. In com­merce, however, the pro­vince is best known by two manufactures ­Shantung, or pongee silk, which has become popu­lar as a dress fabric, and straw braid. The former is essentially a product of home industry. It is woven by women on hand looms. The silk is obtained from the cocoon of an indigenous worm, which subsists on the leaves of the native scrub oak. In 1899 a German company was formed known as "Shantung Eisen­bahn Gesellschaft," with a capital of $11,000,000. Work was at once begun on a main line extending from Tsingtau along the east shore of the Bay and through the natural de­pressions of the north and north­west to the capital of the pro­vince. 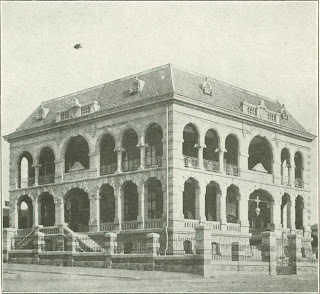 By the spring of 1904 this line was completed, and surveys were begun on two others - one ex­tending from Chinanfu in a south­erly direction, and the other in a southwesterly direction from Kiao-chau Bay, and both meeting at Ichoufu, a prefectural city near the southern border of the pro­vince. The Tsingtau-Chinanfu line has been extended to Poshan, and is 272 miles long. It is well constructed, with a thoroughly ballasted roadbed, good structures, and substantial station buildings. The conductors, guards, and engineers, and most of the station agents, are Chinese. In order that they may have something like the official status and authority which the employees of the government owned railroads in Germany en­joy, the Germans have induced the provincial government to confer upon conductors and sta­tion agents official but­tons, ranging from the fifth to the ninth rank. Most of the employees speak good German – not a gibberish, like the "pidgin-English" of the ports - and it is somewhat startling to see a Chinese guard step to the door of a compartment and hear him an­nounce to the passengers bitte alle aussteigen. Though German jurisdiction is confined to Kiao-chau Bay, the railroad, the mining and commer­cial enterprises, the missions, and schools, all which are carefully fostered by the Government, have made German influence paramount throughout the province. Chinese officials are careful not to take any important action without a clear understanding with their Teu­tonic guests. At the same time, the Germans are obsessed by the spectre of Japanese supremacy. Japan has been an apt pupil of German military, commercial, and manufacturing methods. With the same secrecy and thoroughness which they dis­played in Manchuria, the Japanese have been pervading Shantung, surveying, planning, scheming. Many a man who passes as Chinese is a representative of the Mikado's Empire, edu­cated at the school in Shanghai where young Japanese are taught the dialects of China and the habits and cus­toms of the people. When they have grad­uated and shifted into Chinese costumes, they readily pass as natives of whatever province they may have chosen as the field of their activity. Had she dared, Germany would gladly have taken sides with Russia in the Rus­sian - Japanese War. The downfall of Russia left her isolated as the only power in the Ori­ent whose policy de­mands partition. As the German sen­try peers from the forti­fications of Tsingtau, he sees in the dawn the same fleeting spectral torpedo craft which announced the siege of Port Arthur, and as the sun rises over the hori­zon there bursts upon his imagination the fiery sphere and radi­ants of the Japanese battle flag. Originally published in The World's Work in November of 1914.